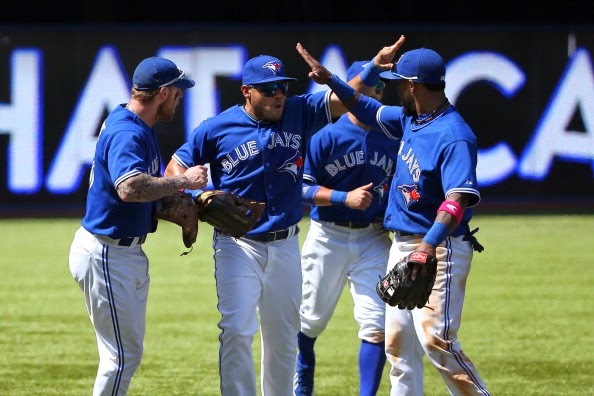 The Toronto Blue Jays are one of the hottest teams in baseball right now. I mean … what else can you really say? When things aren’t going well, it’s very easy to become cynical and dissect what’s gone wrong, who’s not performing and what needs to be changed. But winning cures all of that. All of that stuff really doesn’t matter so long as the team is winning. As the Blue Jays continue to steamroll the competition by scoring a plethora of runs, hitting towering home runs, and turning in solid starting pitching, any questions there may have been about the sustainability of their success have at least been put on hold for now. So in lieu of a full-out post chronicling how great the Blue Jays have been, I’ll keep it succinct in the form of three GIFS for 3 Up 3 Down after the jump. It’s very rare to see the entire Blue Jays bench display complete unadulterated joy, but Edwin Encarnacion’s home run did exactly that. Normally, it’s just Brett Lawrie who’s stoked to see his teammates go deep, but whole bench got into this one. It’s incredible to look down the line and see nearly every Blue Jays player marvel in amazement from the dugout. Heck, even the trainers were impressed by how far the baseball went off Edwin Encarnacion’s bat. It’s no secret that Edwin Encarnacion has been on fire this month. With his 14th home run last night, EE set a new franchise record for home runs in the month of May, and tied Jose Bautista for most home runs in any single month. The two are essentially the modern day bash brothers as Jose Bautista and Edwin Encarnacion rank two and three in home runs since 2011; Encarnacion has 111 and Bautista has 110. You know Edwin Encarnacion is having a monster month when one slugger, Jose Antonio Bautista takes time to recognize another sluggers home run-hitting prowess. 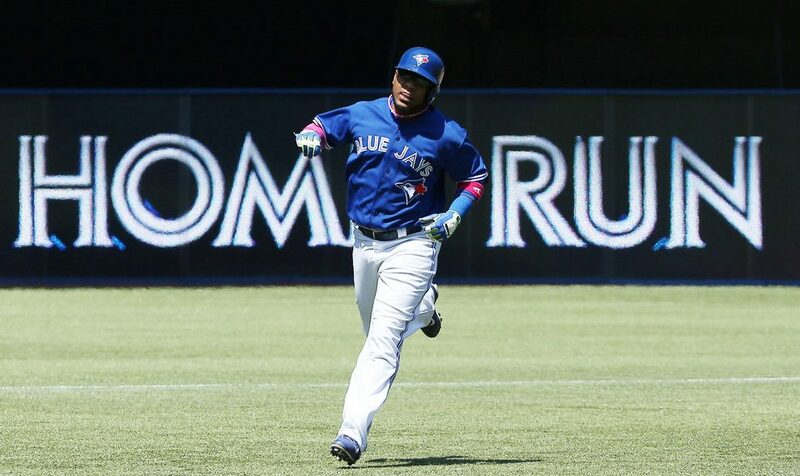 As I’m sure you’ve noticed, the Blue Jays are definitely big on celebrations. The one among the outfielders has become the most famous … but after winning eight straight games, I feel like the enthusiasm here is lacking. While Jose Bautista is fully into it, you have Anthony Gose doing what appears to be the Gagnam Style dance, and then there’s Kevin Pillar who looks like he’s washing a window. Although, I’m glad the outfielders have opted to stop doing the synchronized mid-air jump because if someone were to get hurt, we’d never hear the end of it. Luckily here, all the outfielders have their feet planted firmly on the ground.